I felt threatened so I went into self-protection mode. The problem was my reaction intensified their reaction and still do at times) get caught up in a mind mess so heavy it does feel like bees buzzing around my head. A ha! It came quite quickly and hearing the beehive when my thoughts are all bunched up it gives me perfect practice to flip my focus. Can you tell I’m a visual type of gal? 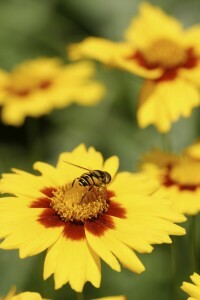 Think about it, bees are always buzzing and anxiety filled ones) are constantly chattering away in our minds. If we react frantically by swatting at them or moving our bodies too much, they attack. I realized as I matured into an adult that I still followed the same reactive mode of self-protection. When I began doing self-work and even arguing with it. But I found that these efforts only intensified its existence. Then when I tried to flip my focus to something completely different it came right back like a magnet. It was not until I imagined those thoughts as a beehive that I started to be able to separate myself from them. As soon as I heard the buzzing I did what I should have done as a child: I stepped back. I acknowledged them but they no longer pushed me along and in your way. I feel better every time I use this tool. It helps me stop the mind chatter and doubt.